N.B. 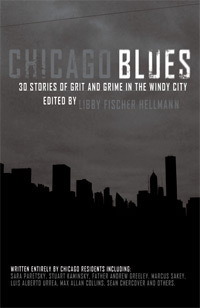 Chicago Blues is FINALLY available as an ebook… at all the usual suspects! You can find it at Amazon, B&N, iBooks, and Kobo. Or buy direct from Libby. On international sites too. Blue is the new noir, and nobody does Blues like Chicago. This collection of dark stories, from today’s best Chicago crime fiction authors, captures the depths to which people sink when they run out of options. The emptiness and pain spawned by greed. The violence—or occasionally, the bittersweet redemption—that springs from a broken heart. CHICAGO BLUES was named the “pick of the week” by both Crime Fiction Dossier and January Magazine!